I can see it now, Solomon is looking up at his ceiling fan thinking, “Vanity, vanity.” As the ceiling fan turns in a circle, again and again. He sees it all as worthless. Of course they did not having ceiling fans back then, but that is the idea I have in my brain. Nothing is in the Bible that is superfluous. In other words, there is nothing written in the Bible that is unneeded. This is one of my personal favorite Scriptures. The reason is that it shows how important the Bible is. When we get to heaven there could be these books that John talks about in this verse. Imagine a Library full of stories of things Christ did on this earth. We will encounter that when we get to talk to the people that lived with Jesus. The Bible is a big book and it could have been double the size with so many stories throughout the years. But God chose every book because each had a meaning and purpose. Remember all of times you tried to read the whole Bible in a year? I can still recall all of the times where I would try to do this and ended up in a book like Ecclesiastes and just stopped for a while. I wouldn’t pick it up again until the next year. I believe that Ecclesiastes is in the Bible because it shows the life of those who do not believe in God. If you don’t worship God or have your eyes on Him, what is the point to everything? The reality is the phrase, “under the sun.” This phrase appears 27 times in the New American Standard Bible (NASB). It is when we do things under the sun, it causes everything to be worthless. This phrase mean that we do things we do, without God. In a unique way to word this we can say that you either do something, “under the Son” or, “under the sun.” We can win an Oscar, Nobel Peace Prize, or any other important medal, but if we don’t have God to glorify what is the point? The truth is that this life is not vanity if you are a believer. If you have received Jesus as your savior, your life is not vanity. It is worth something, it is of value. This is what happens to a lot of people who sink into depression. They come to a place in their life where they see their life as without meaning, purpose, and hope. Hope means to have a confident expectation of good. God wants us to expect good things to happen. He wants us to have hope. We have a life worth living because we have a relationship with the creator of this universe. Jesus is the hope we are all desiring. If Ecclesiastes is negative because he did things without God, then how much more should we be positive doing things with God? McKeever, Joe. “Cartoons from Ecclesiastes.” Pastor Joe McKeever. N.p., 30 Dec. 2011. Web. 24 Feb. 2015. 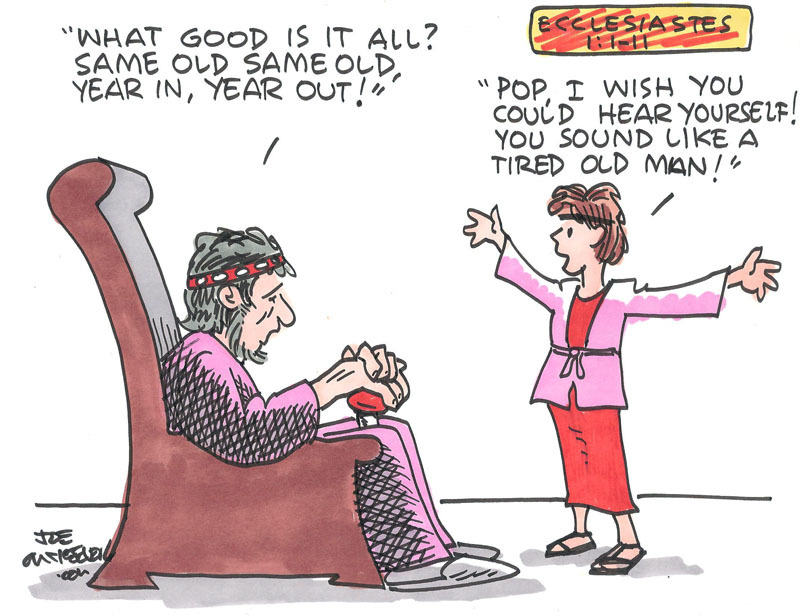 <http://joemckeever.com/wp/cartoons-from-ecclesiastes/&gt;. Thanks a bunch! Glad you liked it! !